The brain of lower animals, such as crocodiles and lizards, consists of just one part, the primitive brainstem. 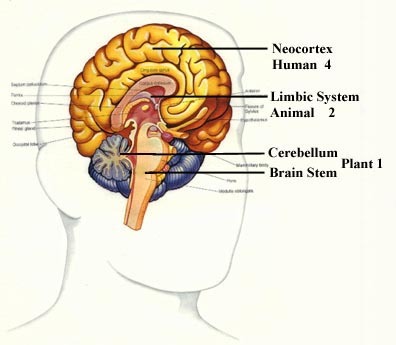 The brainstem deals on in primitive, instinctive, reflex actions – it doesn’t do emotion. Animals like cats and dogs additionally possess the emotional brain, the limbic system. Cats and dogs, unlike lizards, feel simple emotions like fear and anxiety. These feelings however are simple automatic responses to events, amenable to neither reason nor reflection. Moving further up the evolutionary tree, human beings have both a lizard and an emotional brain and also a thinking brain. It is this, the neocortex, which allows for more complex emotions like guilt and love and for the possibility of intelligent emotions. However the work of two recent researchers, Joseph LeDoux and Antonio Damasio, suggests a more complex picture. Both LeDoux and Damasio stress the importance of one small part of the limbic system - an almond-shaped cluster called the amygdala. LeDoux’s research – which was based on observation of fear in mice - points to the existence of a ‘neural back alley’. Signals are sometimes sent to the amygdala before they reach the neocortex. So you sometimes feel and act before the neocortex even gets a chance to process the information. In time, the neocortex may refine your emotion but in some cases – which Goleman terms ‘emotional hijackings’ – the alarm generated by the amygdala is so strong that the soothing of the neocortex has little effect. The amygdala responds quickly, but its logic is crude association. If you once had a nasty redheaded nanny, even now your instant reaction to redheads and nannies may be negative. Since many associations are formed early in life, Goleman thinks that your early years present a crucial ‘window of opportunity’ for emotional intelligence. Retraining in later life, according to Goleman, is no easy matter. Antonio Damasio’s research has found that patients whose link between the amygdala and neocortex has been damaged exhibit extremely poor decision-making skills. The amygdala is a storehouse of emotional reactions. People without access to this storehouse are rather like a rambler without a compass; they can spot alternative paths, but they have no idea how to evaluate them. The amygdala can sometimes cause emotional dumbness, as with over-hasty actions and emotional hijackings, but Damasio’s research suggests that it is also required for emotional wisdom. We need to train and listen to the amygdala, not suppress it.